Here is a new figure set from Master Box. 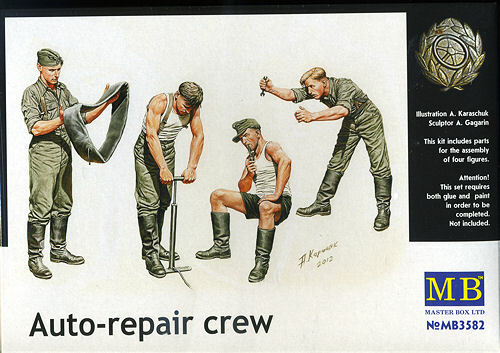 This one is touted as being an auto repair crew and it very much looks like it. You have one man inspecting a tube for the tire, another pumping up a tire, the boss, sitting down and smoking a pipe as well as another man with a wrench, peering into an engine compartment. 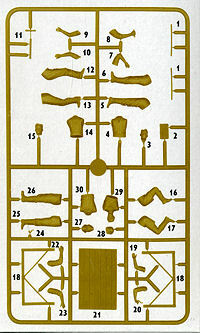 The set also has a work table, though there is nothing to place upon it. One will have to think that some time in the future, they will provide a set of tool boxes, car engines and the such to help populate this scene. As with all Master Box kits, the assembly and painting instructions are on the back of the box. No color information is suppled, but one can pretty well figure most of those out. After all, these sets are not designed for tyros, but those who have experience in the genre and want some of these more unusual poses.